Powers/Abilities: Tarq is a trained communications officer. Any inherent powers and abilities remain unrevealed. (X-Men: Spotlight on Starjammers#2) - Tarq was a communications officer working for Deathbird, the Majestrix of the Shi'ar Empire. He monitored a battle the Starjammers (with Lilandra and Professor X, who then possessed a portion of the Phoenix Force) on a Shi'ar world, and advised Deathbird to focus on acquiring Earth instead of sending reserves to the affected planet. 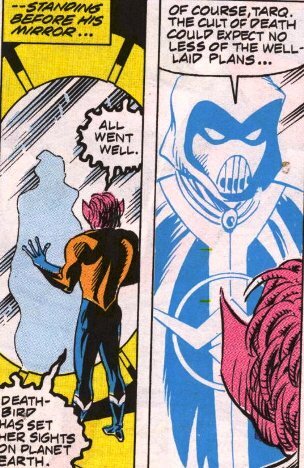 Deathbird, though angry with Tarq for speaking out, agreed. 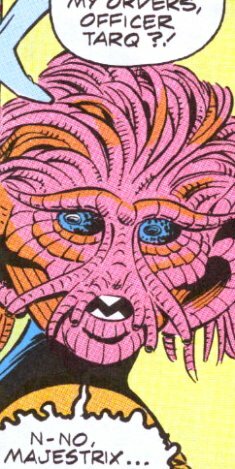 Tarq soon reported back to the Cult of Death, a group of Thanos worshippers, of Deathbird's plan. Comments: Created by Terry Kavanagh, Dave Cockrum and Jeff Albrecht. This issue was never followed up on, so it has never been revealed whether Deathbird pursued this plot against Earth.